Lots of cooks are apprehensive about cooking soufflés. This straight forward recipe is from Galton Blackiston at Morston Hall in North Norfolk and is my favourite; especially as you can freeze the soufflés after the first bake and they sit happily in the freezer to use as a starter or easy supper. Soft butter for buttering the ramekins. Butter the inside of the ramekins well. Heat the milk with the slice of onion and the nutmeg. Bring to the boil and then set to one side to infuse. In a separate pan, melt the butter, stir in the flour and mustard powder. Remove the onion from the milk and bring the milk back to just boiling point. Pour the hot milk into the roux (flour mixture), place the pan back on to a medium heat and continue to stir the mixture with a whisk or wooden spoon. Remove from the heat and beat in the grated cheese and the egg yolks until the mixture is smooth and then season to taste. 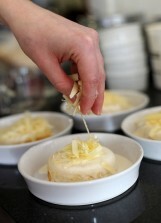 Next, in a very clean bowl whisk the egg whites to soft peaks then fold into the cheese mixture. 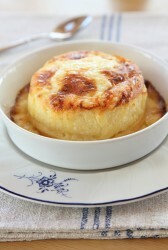 Fill the ramekins with the mixture until three-quarters full and stand on a large roasting tin. Pour boiling water half way up the side of the ramekins and bake for about 20-25 minutes. Once the soufflés are well risen, remove from the oven and allow to cool and sink. Turn the soufflés out upside down onto a buttered baking tray. At this point you can store the soufflés in the fridge for up to 2 days or freeze. However be sure to bring them back to room temperature, to defrost completely before the second cooking. the cream and bake again for approx 10-15 minutes until again the soufflés are well risen and light golden in colour. Serve the soufflés immediately with some of the rich sauce spooned over. I tend to serve with a few dressed leaves a sprinkling of snipped chives and some crusty bread.